Closing Reception: If I knew You, Would You Know Me? | Patchogue Arts Council, Inc. If I Knew You, Would You Know Me? 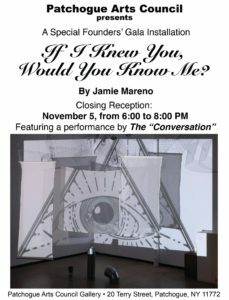 The Patchogue Arts Council is proud to present a temporary video installation by Jamie Mareno, If I Knew You, Would You Know Me? The temporary installation is on view at the Patchogue Arts Gallery from October 26 – November 5, 2017 by appointment only and is curated by John Cino and Beth Giacummo. November 5 from 6-8PM. The reception will feature a performance by the “Conversation”. The temporary installation focuses on the separation of classes and features video projection, text, and performance art while creating an interactive experience. The installation was a special exhibition placed for A Toast to the Arts: Patchogue Arts Council Founders Gala. The theme of the Founders Gala and Mareno’s installation are inspired by Metropolis, Fritz Lang’s 1927 epic German Expressionist sci-fi film drama. PAC is pleased to keep the installtion in place for the general public to experience. Please join us and the artist for a closing reception on November 5 from 6-8PM. A selection of art will be aviable for silent auction and raffle during this event. Jamie Mareno is a graphic designer, photographer, and mixed media artist from New York. She received a Bachelors of Visual Art degree from Briarcliffe College in 2012 and is a participating artist and Assistant Director of the New York Contemporary Art Symposium ( 2013, 2015, 2016). Her artwork has been exhibited across Long Island in many spaces including Briarcliffe College Gallery, Patchogue Arts Gallery, Islip Art Museum and Shand’s Loft as well as Internationally at the Decumanus Gallery, Krk, Croatia, Villa Il Palmerino, Florence, Italy, Ciclo di Vino and Bollicine D Autore, Lucca, Italy. Most recently Mareno returned from an artist residency at Studio Borgo, Lucca, Italy.